Khalid Elwanni is an associate in the Real Estate practice. He advises lenders, borrowers, private equity firms, developers and other institutional investors in an array of commercial real estate transactions. 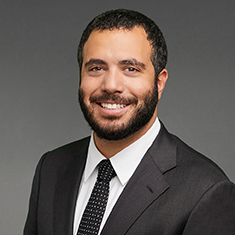 His practice includes a broad range of real estate asset classes involving both commercial and residential properties, including sports facilities, office buildings, retail properties, multifamily properties and apartment complexes. During law school, Khalid served as managing editor of the Northwestern Journal of Law & Social Policy. He also served as a judicial extern to the Honorable Susan E. Cox of the US District Court for the Northern District of Illinois. Prior to attending law school, Khalid was a high school math teacher in Washington, DC. Shown below is a selection of Khalid’s engagements.